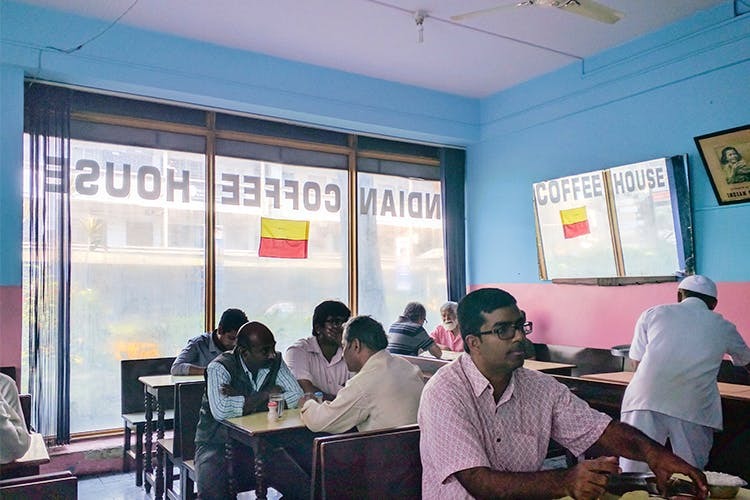 Coffee, masala dosa, lots of chatter and bonhomie, served up with an extra dose of nostalgia — that’s what Indian Coffee House stands for. Indian Coffee House is all about the atmosphere. Blue walls (with some peeling paint and plaster), liveried waiters complete with turbans, and a decor scheme that has not been changed since the 50s. Though the current Coffee House only shifted to its location Church Street in 2009, originally it stood on MG Road, for many years. The coffee house is part of a restaurant chain that has its roots in a workers’ cooperative society and is a city landmark. The menu is small but so good. Start off with their crisp and thin masala dosa which comes with an excellent, thick and piquant dal-based chutney. The masala is not spicy and lets the chutney do all the tricks. You need to take big sips of the filter coffee that comes in old fashioned china cups and saucers. Have we mentioned their really sweet but really awesome cold coffee? Don’t want to do South Indian? Then just order in a plate of scrambled eggs or bread and omelette and as a side order — their mutton cutlets. Most of the Western food here will remind you of food you still get on Indian Railways (proper nostalgia trip this!). The mutton cutlets are crumbly, breaded and deep fried and go rather well with the ketchup and crunchy onions. The Vegetable Cutlet here is also decent and so are the idlis. Don’t question the hygiene of the place. Don’t you dare peek into the kitchen or even go to the wash basin area. Just sit in the old fashioned wooden benches and sip your coffee and discuss politics and the Bangalore weather. Life will be all good! Prices reminiscent of the 20th century, the place also doesn't accept card payments, so carry cash, as your bill is likely to be under INR 200.